A friend owns a dulcimer she loves and it developed multiple cracks in the back and soundboard. The cracks in the soundboard were typical cracks one sees in a quarter sawn spruce soundboard and were easy to fix. The back was another story. The back is made of poplar. Poplar is one of the traditional woods for dulcimers and works well but on this dulcimer the poplar is close to paper-thin and flat sawn. Wood that is flat sawn is much less stable than wood that is quarter sawn. The wood was so thin that usual methods of crack repair were difficult if not impossible. 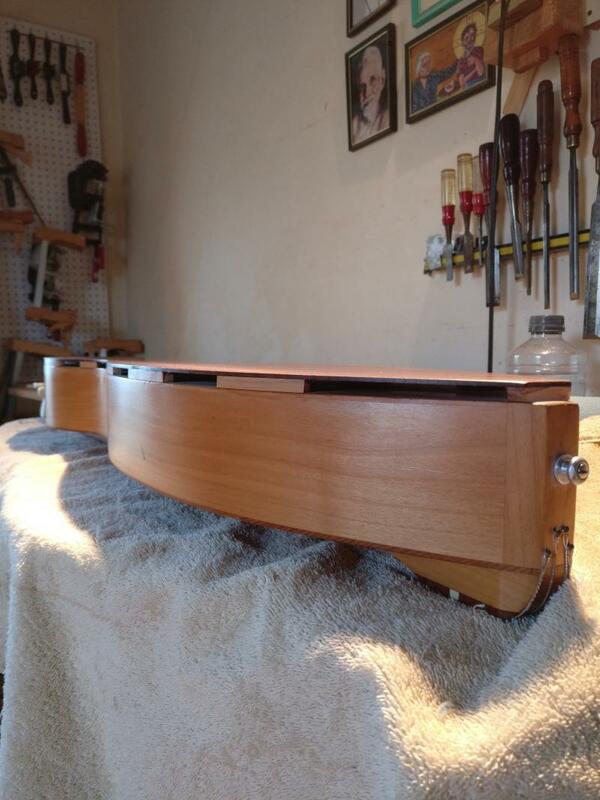 The back of the dulcimer had no bracing and little structural integrity. My first thought was to simply make a new back but my friend loves the sound of this dulcimer and replacing the back would most likely cause it to change. Instead of replacing it I decided to fix the cracks as best I could and add a Galax back. The Galax back will provide structural integrity and should the repaired cracks in the original back open they will not cause a problem. Another part of this adventure was fitting the Galax back to a dulcimer with sides that were not always square, perpendicular, and flat. I don’t know if the dulcimer was made this way or if these problems developed over time. Either way, fitting and trimming the support blocks along the edges of the back was not easy. I decided to choose functionality over beauty and just get the job done. 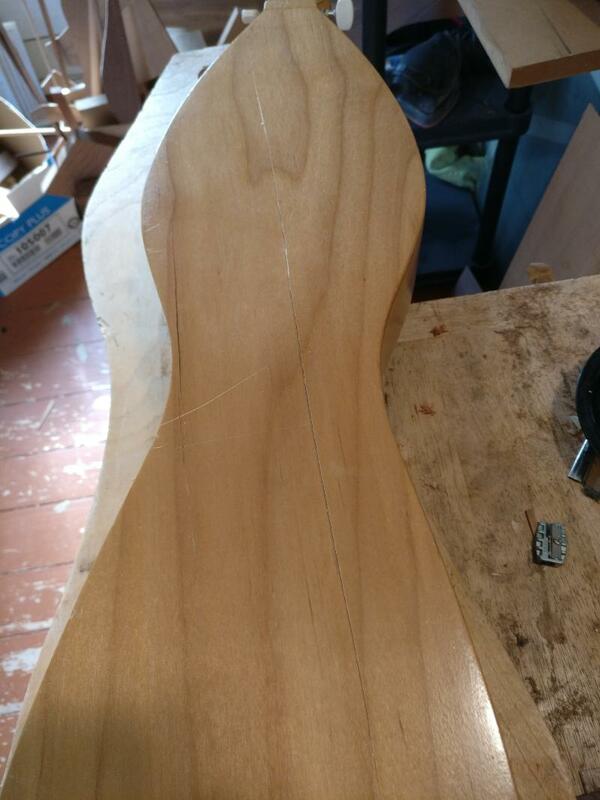 When fitting a new back or Galax back to an existing dulcimer one has to keep in mind that forcing the dulcimer to conform to a flat back might flatten intentional or unintentional differences in height along the sides and result in distorting the soundboard and fretboard. 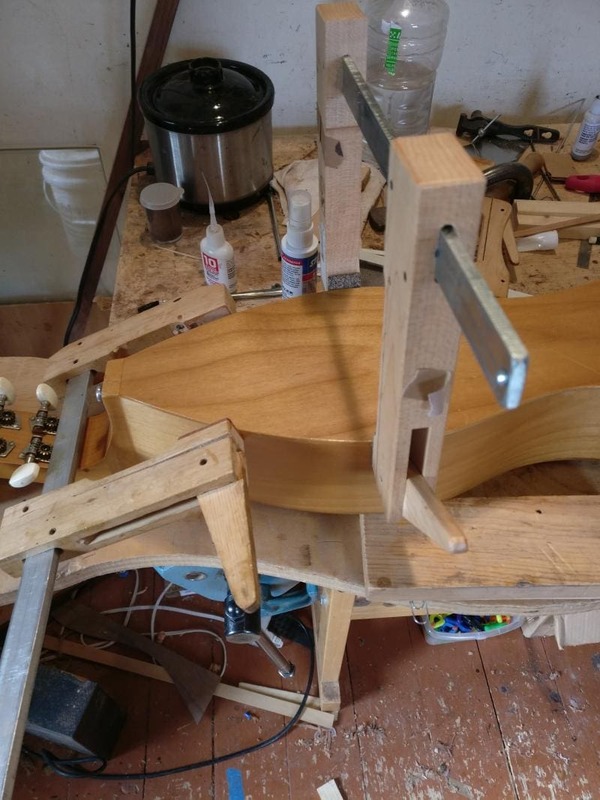 To avoid this I fit the Galax back to the dulcimer and let it follow any irregularities so the existing geometry of the dulcimer remains unchanged. I generally only do repairs on my own work and refer requests for repairs on other maker’s dulcimers to the maker or repair shops I know and trust. This was for a dear friend so I was happy to do it.